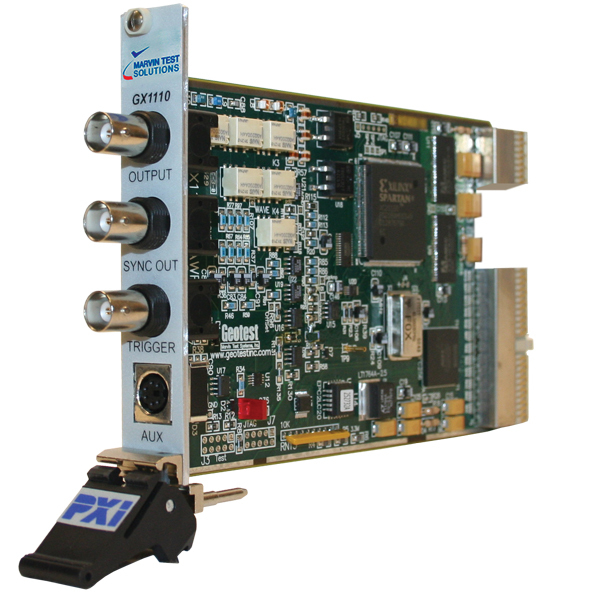 PXI Arbitrary Function Generator Card - GX1100 | Marvin Test Solutions, Inc. The GX1110 is a high performance, single-channel PXI arbitrary waveform generator that offers function generator and arbitrary waveform generator functionality within one instrument. Built-in waveforms are available for use with both the DDS or AWG modes of operation and include Sine, Triangle, Ramp, Noise, Gaussian pulse and Sinx / x. A flexible sequencer is also available as part of the AWG's architecture, supporting the generation of complex waveforms. With a sample rate of 100 MS/s, the GX1110 is an ideal modulation source for troubleshooting encoding schemes as well as simulating signal distortion, power line cycle dropouts, video signals, components failures and power supply transients. The GX1110 Series comes standard with 2 M samples of waveform memory, accessible via a high speed interface. The GX1110 series provides an external trigger input, offering users the ability to control waveform generation via external trigger events. When operating in the AWG mode, waveform trigger modes include continuous, triggered, gated hold, and burst functionality. The GX1110 Series utilizes a PLL, providing a programmable sample clock for the AWG mode of operation. The reference clock is provided by an on-board crystal oscillator, or alternately, an external 10 MHz reference can be used. When operating in the DDS mode, an on-board crystal oscillator source provides a 100 MHz clock source for the DDS generator and associated D to A converter. The board is supplied with the GtWave, a software package that includes a virtual instrument panel, a Windows 32/64-bit DLL driver library and documentation. A trial license for WaveEasy, a software to create, modify and analyze waveform is also included. The The virtual panel can be used to interactively program and control the instrument from a window that displays the instrument’s current settings and status. In addition, interface files are provided to support access to programming tools and languages such as ATEasy, LabView, LabView/Real-Time, C/C++, Microsoft Visual Basic®, Delphi, and Pascal. An On-Line help file and PDF User's Guide provides documentation that includes instructions for installing, using and programming the board. Amplitude Range 100 mVPP to 8 VPP into 50 Ω; double into open circuit. 0.1, 0.3, 1, 3, and 8 VPP, FS ranges. Positive pulse, user programmable and synchronous with the waveform output. Triggered Output waveform triggered by external or software triggered event. The external trigger signal edge may be a rising or falling edge. Start / Stop Output waveform triggered by a trigger signal edge. Waveform is continuously generated until the occurrence of an another trigger edge. The trigger signal may be external or software generated. The external trigger signal edge may be the rising or falling edges. Gated Same as Triggered mode except that the waveform is generated for as long as the gate signal stays true (logic one). When the gate signal goes false (logic zero) the output goes quiescent. Gated Hold Same as Gated mode except that when the gate signal goes true (logic high) the waveform freezes until the gate signal goes low. Burst Output waveform will become active on the occurrence of a trigger edge. The selected waveform is generated for a preset number of cycles between 2 and 1,048,576. Output will then disable.